One of the popular books that have inspired me a great deal is The Seven Habits of Highly Effective People by Stephen Covey. Supposedly, the book has sold more than 15 million copies in 38 languages since its first publication in 1989. I must say, the book has played an important role in improving my effectivity, and I have used it to train many young people in it. The second habit of highly effective people, according to Stephen Covey is to, “Begin with the End in Mind!” This simply means, having a personal vision of life, setting realistic goals, and even writing out a mission statement. We are in the beginning of the ordinary time of the liturgical year. Today we are beginning to listen to the Gospel according to Luke. Throughout this year, which is referred to as Year C in liturgical terms, we will listen to the Gospel of Luke. The gospel text of today – specially edited for the occasion – begins with the prologue of the Gospel in which Luke addresses Theophilus and states the purpose of his writing: “so that your Excellency may learn how well founded the teaching is that you have received” (Lk 1:4). But today I would just reflect on two questions: who are the poor, and what is the good news? I would rather rephrase these questions in a bizarre manner: What does it mean to be poor? And, who is the Good News? 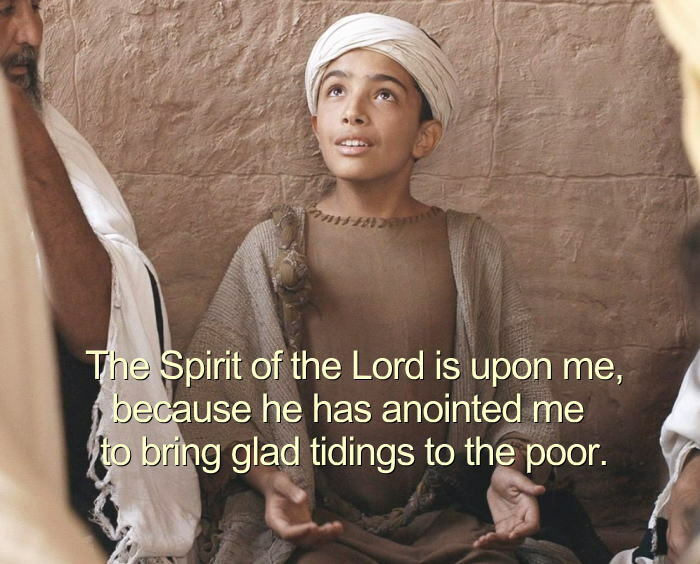 The expression ‘poor’ occupies a central place in the Gospel of Luke. Luke’s understanding of the poor is not much different from that of the Old Testament, where the word ‘poor’ was often elaborated as ‘the stranger, the orphan and the widow’ (Deut 24). Yes, the poor are the materially deprived, the destitute, the afflicted – the most vulnerable people of any given society. In line with the repeated theme of the book of Psalms, Luke wants to portray Jesus as one who hears the cry of the poor (Ps 22:24). He has Jesus deliver his ‘Beatitudes’ from the plains (Lk 6:17), and he would have Jesus admire the little offering of the widow (Lk 21:1-3). Luke also goes beyond the material understanding of the word. Situating himself in a traditional society, he sees women as the poor. The Gospel of Luke is full of stories of women. He would balance almost every man’s story with that of a woman: annunciation to Zechariah is followed by the annunciation to Mary (1:5-38). At the presentation of Jesus in the temple, Luke would bring in two elderly people: Simeon and the 84-year old Anna (Lk 2:25-38). In Chapter 8 Luke has a list of women disciples; in Chapter 15, the story of the man who lost his sheep is followed by the story of the woman who lost her coin. These are but a few examples. So, who are the poor? The poor are those who are in need of the help of God; those who are open to the plan of God in their lives; those who are simple hearted; the humble. When Elizabeth hears the ‘good news’ (Lk 1:19) that was announced to Zachariah, she acknowledges that the Lord has removed her humiliation of being barren (Cf. Lk 1:25). When Mary sings her magnificat in the presence of Elizabeth, she would say, “The Lord has looked upon the humiliation of his servant” (Lk 1:48). In short, being poor simply means being open to God. It is to those who rely on God that the Good News is proclaimed. It is to us that the Good News is proclaimed. If we consider the Good News as a message, then, it is liberty to captives – the experience of freedom from all that binds us including sin; it is healing to the sick – the experience of wholeness; it is the promise of the favorable year (kairos) – the time of Grace. So Good News is not a set of information. It is an experience! Again, the Good News is not just an experience in the abstract. It is the possibility to experience God in the person of Jesus. Jesus Christ is the Good News. This is what actually stirred the hearts of those listeners in the synagogue, as Jesus said: “This text is being fulfilled today even while you are listening” (Lk 4:21). In other words Jesus was saying, “the times that Isaiah prophesied are here. It is possible to experience the Good News in my person!” This was a bit too hard for the people. Luke continues to tell us, “When they heard this everyone in the synagogue was enraged. They sprang to their feet and hustled him out of the town; and they took him up to the brow of the hill….” (Lk 4:28-29). Are we ready to be stirred too – stirred to respond to the possibility of experiencing God in the person of Jesus? Let the Good News then become an experience for us today even as we participate in the Eucharist. Introduction: Jubilees are quite a common phenomena among us. We have jubilees for everything. Jubilee of ordinations, weddings, buildings, provinces, etc.. Many a times, these jubilees are not in line with the Biblical pattern of jubilees. Jesus announces a jubilee year in the Gospel. What is a jubilee in the Bible? What is its purpose? 1. A time to rest and respect all. Originated from seventh day (Sabbath) and later to 50th year (the year after grand Sabbath 7 x 7 = 49). Time to bring good news to our poor, workers, animals, and land. 2. A Time of God’s Mercy. God forgives us. It is the year of Grace of God. A time to experience God’s merciful presence. 3. A time of recommitment. We recommit our Christian calling. A new relationship is established with God, people and nature. Final Punch: I wish to see a priest/nun/ couple who celebrate/s his/her their jubilee by inviting the poor of the locality and eating with them. I wish they become the chief guests of celebration. I wish my jubilee this way.